Get Better at Putting… Fast! 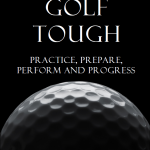 In this article, learn some top putting tips from golf guru Dan Abrahams, author of Golf Tough. Putting is a discipline of precision. It requires pinpoint accuracy. It requires pinpoint control. It’s not like driving the ball, or approach play, where there is margin for error. Push a drive and you can still find the fairway. Pull an approach shot and you may still find the green. Push or pull a putt and you’ll discover that the ball won’t fall into the hole. A golfer with a repetitive putting stroke will succeed more so than the golfer who has an erratic stroke. 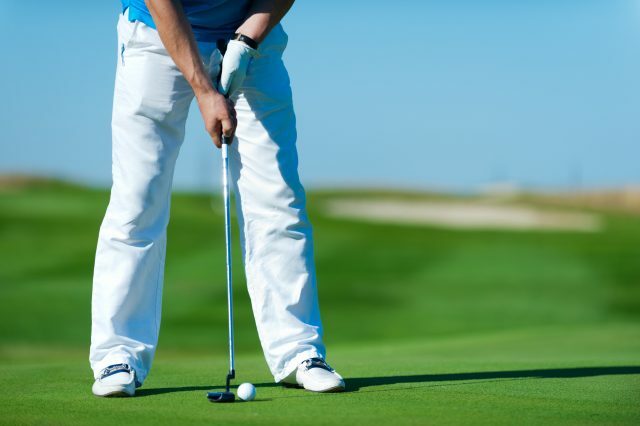 Return the putter face back to the ball in a consistent manner, at a consistent tempo, and you’ll improve your putting statistics considerably. Developing your putting requires a combination of technical lessons, purposeful practice, and an effective mindset. The simple action of engaging in instruction isn’t enough. You need to practice intelligently and you need to coat your putting technique in thick layers of mental skills. All too often, you see amateur golfers (and some professional ones as well) walk onto the practice putting green, throw two or three balls down, and start stroking the ball mindlessly towards a hole. But this kind of random practice rarely improves matters. Practice requires protocols that take into account your current strengths and weaknesses, and which primarily improve your putting through skills tests. Proper practice delivers pinpoint precision on the putting green. Proper practice involves players creating the right playing habits on the practice green. Practice as you play! Measure a one foot radius around a hole (using ball markers) that is on a slope or incline, and then place tee pegs at various distances from 5 feet through to forty feet. Your task is to stroke as many balls consecutively as you can within the markers. Log your score then to try and beat your initial attempt. A similar version of this test is to place tee pegs at five, ten, fifteen, and twenty feet from the hole. Start stroking five balls from the closest distance, and only when you’ve managed to stroke all five into the one foot circle are you allowed to move back to ten feet. If you fail at any given distance you have to go back to the beginning. This is a great way to learn how to hold your nerve and control your emotions. Envision getting to that final putt, missing, and knowing you have to start again – ouch! These skills tests exercise the consistency of your putting stroke and your ability to putt under pressure. With a little imagination, developing your own putting skills tests is simple. Putting balls from different angles with a target of consecutive putts held or striving to stroke the ball within a given radius of the hole are useful barometers for measurement. When you engage in your tests, go through your routine every time. Just as you have a routine for your full swing, so you should have a simple and reliable routine for your putting. To my mind it is vital to place process ahead of outcome. Too many golfers get caught up in outcome. Too many worry about the hole and holing the putt. I see the hole as your source of anxiety – a mind that is directed towards it is one that is easily stressed. I like my clients to remove the hole from their minds. I believe that once you’ve read the putt you need to direct your focus away from the hole to a specific target. But more on this in a minute, let’s begin our routine from the very beginning. A world class putting mindset starts long before you draw the putter back away from the ball. It begins as you make your final few paces before you set foot on the green. This is the time to take out your body controller. Stride onto the putting surface as if it’s yours. This is your area of belief. You may not be the best ball striker. You may not coordinate your hands, arms and torso like some players can, but the putting green is your home. You are in your element on the greens. Great putters believe the putting green is their home away from home. They feel more comfortable on the green than anywhere else on the course. And as you discovered in section three of Golf Tough you can use your controllers to create this love for putting. You can employ your two controllers – your self-talk and your body – to immerse yourself in the process of putting excellence. Walk confidently as you stroll onto the green. Get your self-talk controller out and tell yourself: “Great, I love this part of the game. I’m going to put a free stroke on this and give the ball a great look at the hole.” Use your body controller to stand tall and be authoritative with your movements as you mark your ball and step back to allow your playing partners time to putt. When it’s your turn to putt re-mark your ball and start to read the line. Now is the time to pinpoint your focus and emphasise your confidence. Read the putt with a sense of commitment and decisiveness. Think decisive and be decisive. Maintain this sense of strong-mindedness and certainty as you prowl the putt. From their read, some people like to focus on the whole line of the putt whilst others like to pick a small target to aim at. There is no right or wrong way, just make sure you do the same thing every time. And make sure you maintain your feeling of commitment to your chosen line or target. When you’re ready take your stance next to the ball and, just as you do with your full swing, take some practice strokes as a blueprint for the real thing. Incorporate a keyword – belief, free, confident, focused, commit or solid might be a useful self-talk process at this stage. When you’re ready, place the club behind the ball and re-create the blueprint you’ve just experienced in your practice stroke. Let it go. Enjoy a free but focused stroke back and through the ball on your line or towards your target. And that is all you can do. That is all you can expect of yourself. Read the putt with confidence and certainty, take some focused free practice strokes and then let it go. You can’t force the ball to go in the hole. You can’t make great putting happen. You just have to let it happen. There really is nothing else to it. Note: This putting tips article uses extracted content from Dan Abraham’s acclaimed book Golf Tough: Practice, Prepare, Perform and Progress. 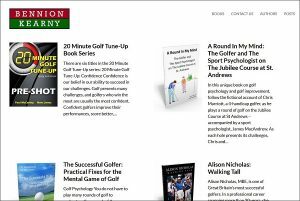 Bennion Kearny publishes a number of books covering putting tips, confidence, pre-shot routines, and much more. Learn more about Golf Tough and our other golfing titles here. High School Soccer Programs: Do You Trust Your Players?